Soft skills are becoming increasingly vital to employers when differentiating between candidates with similar experience and education. Be it team spirit, communication skills or being a quick-thinker, expressing and demonstrating the right soft skills can make hopeful applicants stand out from the crowd. In the competitive hiring environment, employers are asking and looking for certain soft skills to establish the most suitable people for the role. While technical and experience-specific skills still very much have a place in the mind of a hiring manager, soft skills give candidates an edge and show potential employers the social and cultural benefits they would also bring to their new role and company. Job meta-search engine Joblift have analysed which soft skills crop up the most frequently in the 9,542,193 jobs posted online in the UK in the past year. Over at Joblift, we have also analysed the top soft skills in France, Germany and the Netherlands as a comparison to the UK’s results. 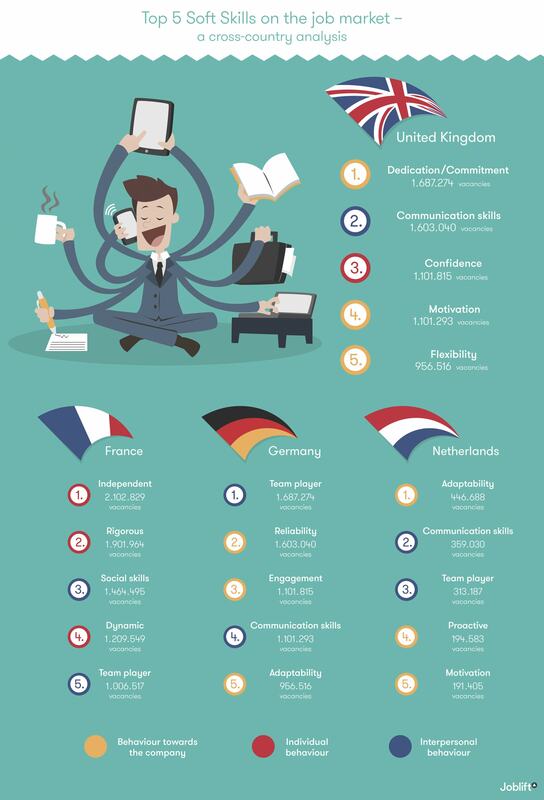 Interestingly, the UK has the most in common with the Netherlands in terms of soft skills and shares the least with France. You can see that communication or social skills rate highly for all of the four countries, with this soft skill being in each of the countries’ top five. This indicates that regardless of location, European employers see communication as central to a successful hire. The UK and the Netherlands have the most in common, with communication skills and motivation featuring in each of the two countries’ top five. The UK is the only country analysed which does not feature team work or team spirit in its most sought after soft skills. In fact, the majority of the UK’s most desired soft skills focus around an individual’s behaviour towards the company and their work, rather than individualistic or interpersonal behavioural tendencies. In addition, confidence is a soft skill that only features in the UK’s top list. In France, on the other hand, most of the top soft skills are based on individual behaviour tendencies, with three out of five centering around personality traits. Germany and the Netherlands share the same ratio of interpersonal and company-oriented soft skills, whereas, for these two countries individualistic requirements do not feature at all in either country’s top five. The differences in behavioural focus makes for an interesting cross-country analysis; employers in Germany and the Netherlands seek candidates with skills that will directly benefit the company and inter-team relations. Whereas, French hirers look more favourably on individualistic behaviour in applicants, and therefore, seem to focus on the abilities that the individual has themselves rather than their behaviour towards the company. The UK also stands alone in its top soft skills; the majority of desired soft skills are very company focused, with an equal share of individual and interpersonal behaviour. So, if you’re looking for a job in the UK at the moment, remember to demonstrate – dedication, communication and confidence!